Who Goes There? (1938) - John W. Campbell, Jr.
Who Goes There? is a science fiction novelette by John W. Campbell, Jr. under the pen name Don A. Stuart, published August 1938 in Astounding Stories. The Thing From Another World is a 1951 science fiction film which tells the story of scientists at a remote Arctic outpost who fight an alien being. The movie was loosely adapted by Charles Lederer from the story "Who Goes There?" by John W. Campbell, Jr.. The film took advantage of the national feelings of the time to help enhance the horror elements of the story. The film's release in 1951 coincided with the Korean War and the upswing in anti-communist feelings brought on by McCarthyism. The idea of Americans being stalked by a force which was single of mind and "devoid of morality" fit in well with the parallel feelings of the day on communism. The screenplay changes the fundamental nature of the alien as presented in Campbell's short story: Lederer's "Thing" is a humanoid monster whose cellular structure is closer to vegetation although it must feed on blood to survive. One character describes it as an "animated carrot". In the original story, the "Thing" is a lifeform capable of assuming the physical and mental characteristics of anyone it chooses. 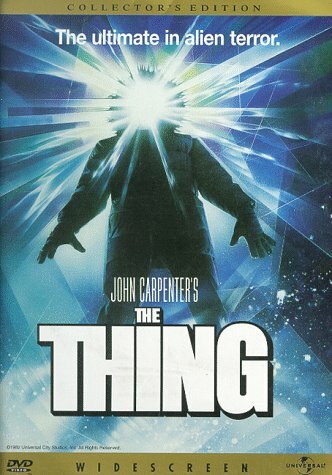 The Thing is a 1982 science fiction/horror film directed by John Carpenter. 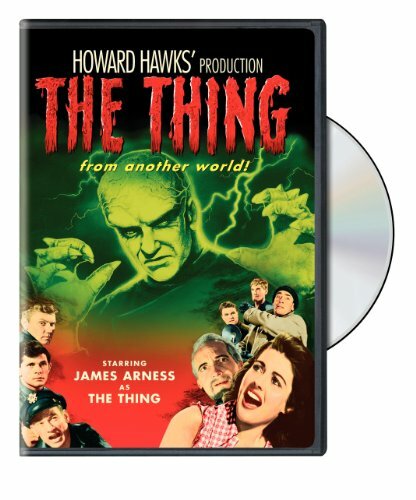 Ostensibly a remake of the 1951 Howard Hawks film The Thing From Another World, Carpenter's film is actually more faithful to the short story that serves as both films' source material, "Who Goes There?" by John W. Campbell, Jr. The Thing stars Kurt Russell, Keith David, Wilford Brimley, Richard Dysart and Richard Masur, among others. The musical score was by Ennio Morricone, a rare instance of Carpenter not scoring one of his own films. The story takes place in Antarctica. An American research station receives a surprise visit from a seemingly insane pair of Norwegians, who are attempting to shoot a runaway Husky dog. The Norwegians are killed, and an investigation of the burned-out Norwegian research station reveals that they had uncovered an alien spacecraft from under hundreds of feet of ice. It is soon revealed that the runaway Husky, now in the Americans' care, is in fact, an alien life form that duplicates its host's cells with its own. The result is an alien predator with the ultimate camouflage, a perfect reproduction of its host. Gradually, paranoia sets in among the Americans, as none can be certain whom among them has been infected. Many characters' names are taken directly from the original Campbell story, as is a scene in which Russell's character devises a test to see who may be infected, by exposing a sample of each man's blood to extreme heat. Upon its release, the film was lambasted by critics for its special make-up effects, created by Rob Bottin, which were seen as excessively bloody and disgusting. The film fared poorly at the box office, only to see its reputation improve in subsequent years through home video releases. It is now regarded by the majority of Carpenter's admirers as one of his finest films. A collector's edition DVD was released in 1999.